Scarily good marketing results – who dunnit? As brands and marketers discuss ROI (return on investment), marketing results continue to play an important part in promotional strategy. With many metrics helping marketers decipher which campaigns and channels are successful for their brand, this Halloween we discuss some of PRG’s scarily good recent campaign results. Importantly, since Halloween is almost upon us, we ask in true murder mystery style ‘who dunnit?’ Was it Facebook advertising in the car showroom or perhaps it was email marketing in the tennis suite? Deciding on the right channels for your marketing starts with assessing your objectives and who your target audience is. Our team will assess your target market, how they interact with brands and importantly when and where they’re doing it. This enables us to find effective solutions for reaching the people who matter most to you and deliver fang-tastic, tangible marketing results. Our spook-tacular Halloween infographic shows some of PRG’s marketing results for both business-to -business and consumer clients. The Nature Valley International Tennis tournament’s hospitality suite has seen a 300% increase in sales, while Audi’s targeted Facebook advertising campaigns saw 160,000 potential customers exposed to the brand. 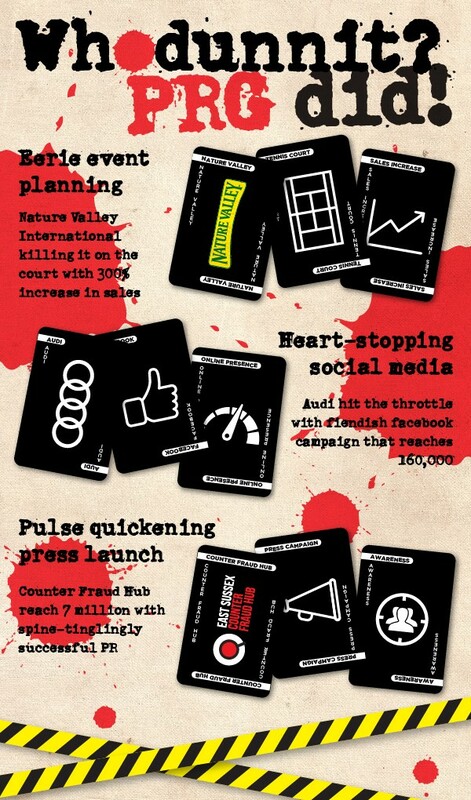 It isn’t just events and digital marketing our team have excelled in over recent years, with the East Sussex Counter Fraud Hub seeing an estimated 7 million people reached via a PR launch to promote their reporting website and hotline. Our spellbinding full service capabilities allow our team to utilise in built analytics tools, goal tracking, unique URLs and Google analytics to monitor your marketing results. Whether sending targeted email campaigns, running Google Ads or advertising in trade media, our team will ensure your campaigns work a treat! To find out how our marketing experts create eerily great campaigns that deliver out of this world results, please contact us or call 01323 411044.